We’re pretty big fans of the platform. Make no mistake, we’re not hating on Squarespace. 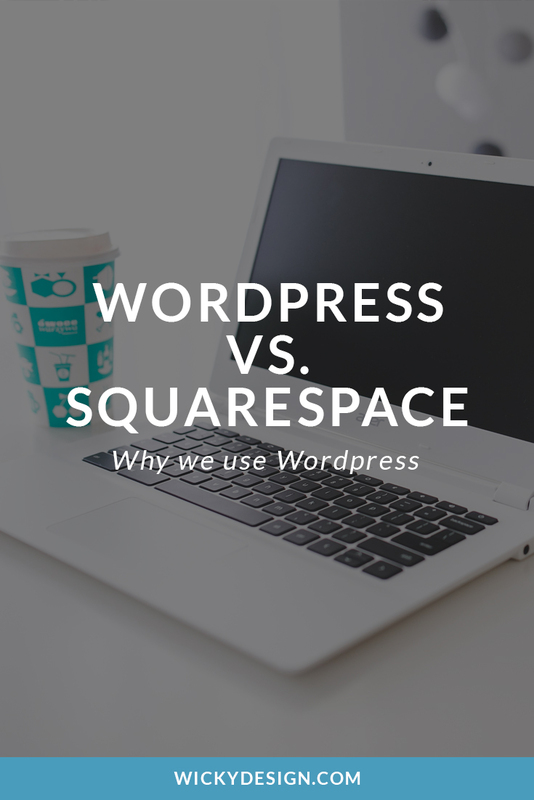 We actually think it’s a great website builder, but as designers and developers, we prefer using WordPress over Squarespace (or any other website builder). Below are a few reasons why we love it. WordPress is an open source platform, meaning that it is free for anyone to download, use and change. When you use WordPress, you become part of a large community of people that offer free support, plugins, add on’s and new themes. Because WordPress is open source, you’re able to do anything you want with your website. With Squarespace, everything is closely controlled and tested within their environment, so you’re limited only to what they offer on their platform. While this may give you piece of mind, it doesn’t give you nearly as much flexibility as a WordPress site will give you. With WordPress, you’ll have access to everything used to build your website, which gives you the option to host it wherever you choose. You can only host a Squarespace site on Squarespace. All of the templates they use are exclusive to their platform, so if you ever decided to move your site, you would lose the look and feel it had while on Squarespace. WordPress offers literally thousands of themes that you can customize to make your site look great (or you could design your own theme). There are also thousands of great plugins available that will make your site do all the things you want. While Squarespace themes are beautifully designed, they may not offer what you’re looking for and they don’t have nearly as many options. If you’re setting up an online store, WordPress is the way to go. There are a ton of different options for e-commerce, giving you the ability to customize your shopping cart however you need. With Squarespace, you’re limited to their simple cart options and can only use Stripe as your payment gateway. While WordPress might have a steeper learning curve than Squarespace, we still think that it is very easy to use. While it may not be a drag and drop editor, no coding knowledge is required to make edits to your pages, write blog posts, or update images. While we do think that Squarespace is a great platform, we prefer all the flexibility WordPress gives us when building a website. We can give our clients exactly what they want with a WordPress site, where as with Squarespace we are limited to fewer options. As a business owner, you’ll have complete control over your website and have no limitations as to what you’ll be able to do with it. We love WordPress and think it’s the best option for building a website.